This sweater from J.Crew is perfect for Spring. I love that it is long and that it has the slits in the sides.It is very light weight and airy. I actually love it so much that I am headed to J.Crew today to pick it up in another color! I am obsessed! And J.Crew has 20% off for card holders! I have been in a bit of a lipstick rut (lol). I am so bored with all of my lipsticks and whenever I go to buy something new I feel like it looks so similar to something that I already have. I was so excited when I discovered the Bite Beauty matte creme lip crayons at Sephora. It comes in 6 really vibrant colors. I got 2 colors not knowing if I would like them and I was so impressed that I think I am going to get a couple more. The colors are so bright, it lasts all day and they smell so good (I have never had a lipstick that smells this good)! I personally prefer matte lipsticks. I just find that they stay on much longer then others. Anyway, If you are looking for a new lipstick to try I highly recommend these. I am sooo happy that it is Friday! I hope you al have a great weekend! I know it's not part of the outfit..but I really like the lipstick you are wearing in these pictures. Jade, I really love your sweater and have been considering ordering it as well. Do you mind me asking what size you ordered. It appears like it's supposed to look bigger on, but I am not sure. Thank so much! You're too cute! Love the color combo! Even though it's a neon green color, I like that it's not too "in-your-face" neon, haha. Such a fabulous outfit! Swooning over your top! love the colors going on here and absolutely love those jeans! i have been wanting some light wash jeans for a little while now, i just think they are so cute! Amazing!! Love the color combo! Looove this look!! I look forward to reading your blog everyday!! Super cute!! Absolutely gorgeous! 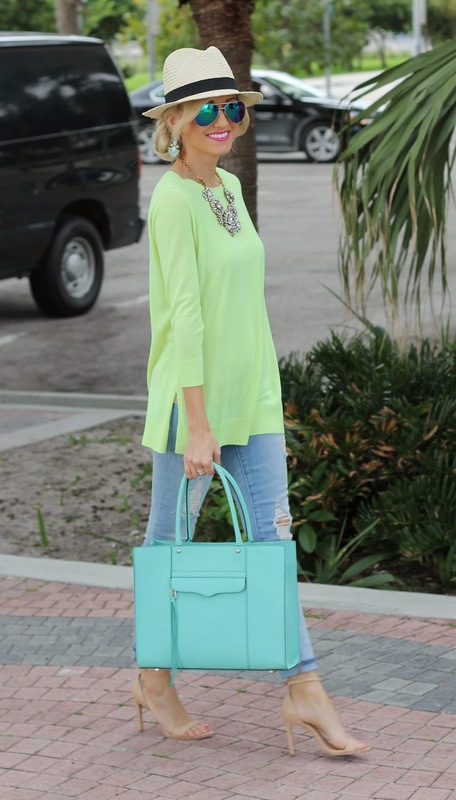 Love the neon and that bag is heaven! Love the heels...so simple and elegant! Loving the pastel colours!! That shirt is so pretty..
You have the cutest clothes! Perfect for spring! I love the pastel colors together, they look lovely. And the color of that bag is to die for! Have a great weekend. I absolutely love the mint colour! I blame you on making me wanting this bag (the mini version) in this colour now too! Ack! I love the colors of this look, so vibrant! LOVE the hat!! I just bought a hat the looks almost identical from Target and I can't wait to style it! Such a cute outfit!! Super chic and pretty outfit! You look beautiful! Love this look...the shoes are gorgeous! 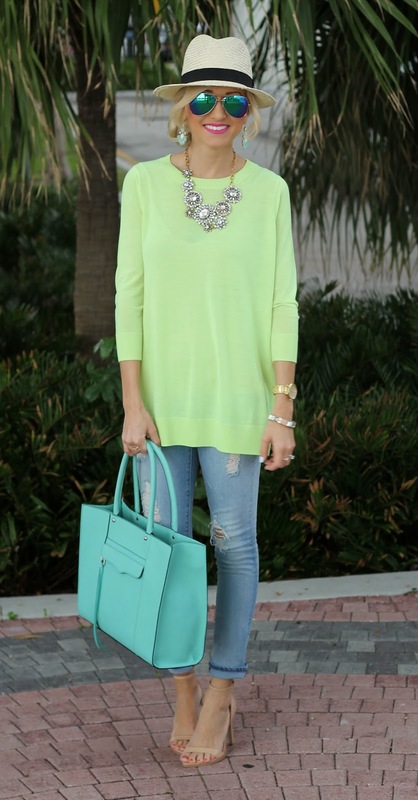 This is a wonderful combination of colors to kick off spring. I'm so in love with this look! Every detail is perfect, I love that you went for two statement pieces of jewelry and the color combination is phenomenal! Great styling! What amazing photos- beautiful color palette! Jade, I am obsessed with this look! The sweater, is it the one they are calling "neon yellow" on J. Crew website? Yes it is the neon yellow. It is more of a neon lime in person. عزيزنا الزبون اذا كنت تجمل هم الاسعار – لاسيما في وجود ما نعيشه من صعود في الاسعار – فاستعن بشركتنا فهى لاغير من ستقدم لك افضل و اميز الخدمات بأرخص سعر محتمل .